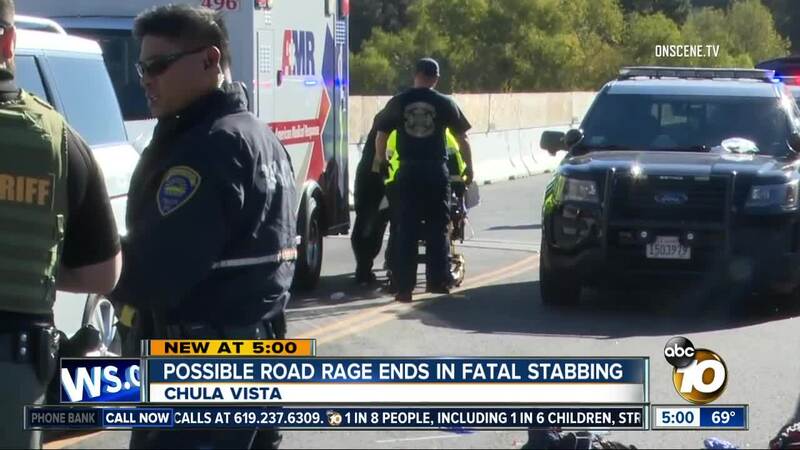 SAN DIEGO (KGTV) - A “rolling altercation” between two drivers in the Bonita area led to the stabbing death of one man and the detention of another. Chula Vista police Capt. Phil Collum told 10News the incident was reported just after 9 a.m. at the intersection of Sweetwater Road and Willow Street, near the Chula Vista Golf Course. Collum said officers that responded to the incident arrived to find an unidentified man lying on the ground with stab wounds. Life-saving measures were administered before he was taken to Scripps Mercy Hospital. The man died from his injuries upon arrival, according to Collum. The other man, 60-year-old Rickey Smith, remained at the scene. Officers said they found a folding-blade knife, believed to be the weapon, on Smith's belt. He surrendered without incident, police said. Collum said witnesses reported the drivers of a white Ford Ranger pickup and silver Nissan Quest minivan yelling at each other before colliding. Smith left his truck and stabbed the victim, who was still in his minivan, police said. No other parties were involved, Collum told 10News. Police are asking for any other witnesses to call 619-422-TIPS.